Today no one, except the peculiar and esoteric race of men called “liturgiologists,” is interested in what was in the past a major preoccupation for Christians: the feasts and the seasons, the cycles of prayer, a very real concern about the “kairos“–the time of liturgical celebration. Not only the average layman, even the theologian seems to say: the world of Christian “symbolism” is no longer our world, all this failed, all this is gone and we have more serious affairs to attend to; it would be unthinkable, ridiculous to try to solve any real “problem” of modern life by referring it, say, to Easter or Pentecost, or even to Sunday. …The real tragedy of Christianity is not its “compromise” with the world and progressive “materialism,” but on the contrary, its “spiritualization” and transformation into “religion.” …Christians were tempted to reject time altogether and replace it with mysticism and “spiritual” pursuits, to live as Christians out of time and thereby escape its frustrations; to insist that time has no real meaning from the point of view of the Kingdom which “beyond time.” And they finally succeeded. …The cross of Christ signified an end of all “natural” rejoicing; it made it, indeed, impossible. From this point of view the sad “seriousness” of modern man is certainly of Christian origin, even if this has been forgotten by that man himself. Since the Gospel was preached in this world, all attempts to go back to a pure “pagan joy,” all “renaissances,” all “healthy optimisms” were bound to fail. “There is but one sadness,” said Leon Bloy, “that of not being a saint.” And it is this sadness that permeates mysteriously the whole life of the world, its frantic and pathetic hunger and thirst for perfection, which kills all joy. From chapter three in For the Life of the World by Alexander Schmemann (48-49, 54). From chapter VIII, “The Romance of Orthodoxy” in Orthodoxy by G.K. Chesterton. A flash back to some earlier Chesterton today that reminds me of many passages by Lewis such as this and this. That is what the moderns mean when they say that the ancients did not “appreciate Nature,” because they said that Nature was divine. Old nurses do not tell children about the grass, but about the fairies that dance on the grass; and the old Greeks could not see the trees for the dryads. From the “The Ethics of Elfland,” chapter III in Orthodoxy by G.K. Chesterton. When grave persons express their fear that England is relapsing into Paganism, I am tempted to reply, “Would that she were.” For I do not think it at all likely that we shall ever see Parliament opened by the slaughtering of a garlanded white bull in the House of Lords or Cabinet Ministers leaving sandwiches in Hyde Park as an offering for the Dryads. If such a state of affairs came about, then the Christian apologist would have something to work on. For a Pagan, as history shows, is a man eminently convertible to Christianity. He is, essentially, the pre-Christian, or sub-Christian, religious man. The post-Christian men of our own day differ from his as much as a divorcée differs from a virgin. The Christian and the Pagan have much more in common with one another than either has with the writers of the New Statesman; and those writers would of course agree with me. 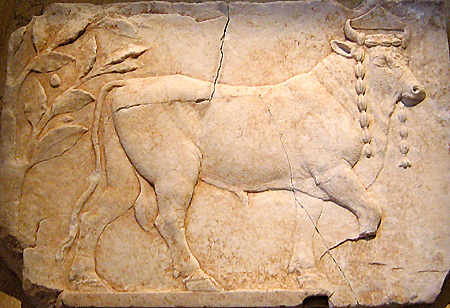 Marble relief of a bull prepared for sacrifice. 1 century AD. I heard this first passage last week in a lecture by Ken Myers. This second passage (also by Lewis, from Prince Caspian) caught my attention over the weekend as I read to my kids. In it Doctor Cornelius shares his hope that the “old days” might be restored. (He even gives Caspian a touching little regimen to follow: “be kind to the poor remnants of the Dwarf people … gather learned magicians and try to find a way of awaking the trees once more … search through all the nooks and wild places of the land to see if any Fauns or Talking Beasts … are perhaps still alive in hiding.”) As Lewis watches the dissolution of a post-Christian West, he is longing for a pre-Christian world. In reflecting on this, it strikes me that every child starts out with the potential to make a devout pagan. Childish worlds are full of wonder and fear of the most passionate and lovely kinds. They are capable of being overwhelmed by a world that “is charged with the grandeur of God.” In some respects (particularly given the plasticized and fast-paced modern lives that we tend to live), it could even be said (by way of analogy) that the primal paganism in children must first be guarded and nurtured before they can start maturing into true Trinitarian Christianity. “Do you think there are any?” asked Caspian eagerly.